Оазис пробуждения - Diary of the Remote Third Winter Games. Issue 8. Diary of the Remote Third Winter Games. Issue 8. The process of awakening there is a sudden and dramatic, but events leading up to it gradually. Sometimes it happens through the spiritual path and committed meditation practice, but often awakening occurs through the tragic life events such as terminal illness (serious or life-threatening), loss of the ability to move, loss of career, a loved one, financial collapse, etc. They serve the cause of the destruction of the hard outer layer of identity (conditionality) and open space for the manifestation of inner wisdom of what we really are. Consciousness ruthless game, she does not know logic and inevitably plays in their insane rules until the player does not reach full delivery -before this insane force. The way the game - this is just one of many possible ways as consciousness itself also awakens. When we are in a non-conducting, we do not know what they do. But because we are unconscious and sleep, we did not notice. But when we begin to wake up and begin to see what is and what we do, we do not like much to begin. For example, we do not like that in the body of a lot of pain, negative emotions, feelings snare that is not committed that act is an act committed by fear. But the awakening always happened: "I was blind God-but now I see! On how the players played in the eighth game, read in this roundup. It is difficult to accept the reality. It is difficult to see the character in the game of consciousness. I remember that I am no longer just about anyone. Once I see a nagging claim is a grasping me. First you have to focus on yourself and take to deploy all its manifestations arise from the reality. Then sort the conception and test - whether they are true? Change can not do anything (it is time to have these thoughts left alone), I can accept. Consciousness so wanted. The absolute reality all she knows me there is something there to redo (calm down already in this respect). Humility. In reality, what has occurred, all the rest (of thought) have relative. The practice, my ego is mad, do not want, will not be boring, meaningless, no results, why, why. Is it pointless? And absolutely no results? Well, not quite so sure, but minor progress, well, just a drop in the bucket. Well, it's better than nothing, and who and what you were without it, even in the worst of meaninglessness? Yes it is. But right now I do not have warmth and love and attention. Well, you can always get it you have in unlimited quantities, just take it. Ego has calmed down, it understands the importance of the process, just naughty, but now it is warm and calm. I am reminded of another old my dream, where I teach people to fly. I said, the main thing is not to think about what you can not fly, and imagine that I can easily lift off the ground and flew, it was all so simple. And now a cliff siganut need faith only. This course is very symbolic, but can not? After all, we believe the ego when it comes up with its images of illusion. Dwarf resists slips different thoughts, trying to persuade to stop the practice, "you see the body all right, well, think head slightly strained," he blurted. All you lost. What can I change in yourself so that this is not happening to me? Again, to say, "Go away, you yourself did not suit me!" No, I always do, to change their perception of the situation that no one can leave. Just be . Well, thank consciousness and accept this experience, after this stage will be followed by another. What is my game in this season? Be predictable in their actions. Male friend was positive guy and despite serious damage to the machine treated the situation with humor, together we have helped to push the car in tow, discussed the repairs and I noticed that with a favorable mood, even the traffic cops are involved in a common cause, all reflected. How do without me. It is my lifelong tendency - to attract all to live their lives, proving that everything I need, I'm very good, and I have something to love! Pulled her children stay with me (so that they have two apartments, move from one to the other), it is true, "dare" to say to me one o'clock did not come into the room, I do. And no one argued, would say three, then three. I have no one bothers to love not only them, but also themselves. Just everything I'm still learning. This is one of my concerns - the devaluation itself. The concept that to love yourself is to be selfish, selfish and not be good, so just do not give up. Helping others turn a reasonable borders, allowing to push everything that is necessary for me on the back burner and do what others need. At the same time others will not really appreciate what I have to give all your time and effort. If I do not appreciate, why you should appreciate others? ((Who is the other? There is no one here just me)). But I am very glad that I can say: "No, I'm busy" and does not cause any anger or resentment (except that slight surprise and the one who said, and those who said - in his. Ha ha!). What is the big difference between when you make a deal with the love and when you do it because you have to. It is necessary to bring their dad to the pass, because have not carried or want to go with my dad to the pass, show beauty, to communicate. Just two different things. Dad sits behind the wheel and confidently pushing on the gas snowmobile tries to jump out at us, but Dad time it resets, let it happen, do not interfere, so what, that we can fly into a tree - but Dad will be pleased that he was given a ride . We remember our children's hiking in the woods, it was Dad gave me the school and instilled a love of nature, it is time to return to him with gratitude. It seems that on the track head includes all its capacities including spare and just does not want to turn off) Resistance is, it is always there, in between thoughts notice of people and trees around, hear the crunch of the snow, I'm here and not there, in his imaginary world. Breathing becomes deeper, clearer head, stops and turns toward the sun - it was hot and the skin gently on the face absorbs this heat. The way back is easier, flying from the mountain, the body as a feather, fulfills movement. Sometimes it merge with the body, sometimes the mind returns to its reality. The struggle continues. I'm so glad I could afford to go and did not report to anybody! a feeling of freedom. In the evening meditation felt unpleasant pain in the neck. Energy image of a gray stone, oval, smooth edge, located on the back of the head to the seventh cervical vertebra. Pain intensity of 9 points. It becomes transformed by dissolution. I presented a very strong solvent and brush began to smear and to dissolve the stone. Everything turned out, but not until the end, was still feeling uncomfortable, then I transformed the remains of the breath of pain, all the pain there is, up to 1 point. Already the most will not believe a miracle for some! Then the music in my head, the tune piano, easy and pleasant. Thank you!!! He went further resistance. When the head came the word resistance, I said to myself Stop! He's my mirror reflecting my resistance to life in many aspects. Ha ha ha! I felt ridiculous and painful. Pain in the chest, throat, the emotion of anger, resentment, self-pity. This is shown by my gift. Looking at this situation came the wisdom that comes from the resistance of suffering. We're like two sheep stood leaning on their horns, they resisted. Exulted The ego, of course, I put myself first, important. And seeing all this from the outside, was already disgusted by herself. I sit in darkness on the floor in the midst of a half-empty room. Again acutely I feel the loneliness. At the moment of death, all alone. For fear of loneliness is the fear of death. The breasts feel heavy, heart is torn from the pain, I want to go to the very epicenter of the weather, and throwing open his hands to give her to the wolves. Tears flowing stream. I remind yourself who ya Watching what is happening. Consciousness need this experience. I'm home, I'm safe. I looked out the window with love and gratitude. The breast appears warm, it disperses throughout the body, erasing the anguish and loneliness. Through the experience with him I live so much fear and pain that I can only express gratitude for such jolts to freedom. I do not want to sink into the offense. He - my reflection. I confine itself. I do not accept poor. Idealized world and struggling with the fact that does not fit into my idea of ​​this mire.Mne wanted to play, but do not be offended. Who am I? Consciousness. Who betrayed? Identification with the body (character) Consciousness. Who betrayed? Character. Who is the character? This is also a consciousness that plays with itself. There is the one who betrayed no traitor. There is an experience that living consciousness. How to live: in the perception of pain, heaviness in the body, not hiding, and still trusting, not blaming, mindful of the law of rhythm, with love and gratitude. While walking home enjoying the warm, sunny weather, on the roof streams running water. Tomorrow will icicles! It was the thought of desires. Desire as well as having the choice of the time. That suddenly want ice cream, then go to a concert, you see a friend, to buy any thing, the husband kind and sympathetic, then get rid of all fears and suffering, just unconditional love in your heart. And everyone desires a reason: it wants to sweeten this life (as a child my mother always hid from us sweets), the warmth through the music or dialogue, which lacked in childhood, then feel beautiful and happy by new things. Source Love - inside. But what does that mean, I could not understand until you start reading a book about the experience of Omega. In practice, the feeling appears in the form of pointed snowflake with jagged edges, sharp, light and mobile, color - blue, the intensity of pain - 4 points. Transformed by dissolving further breathing. The pain goes away. I repeat - the source of love - inside. I focus on your breathing, catching the moment. Finally, I feel the warmth and realize where it is - my source. There are tears of joy in the body lightness, thanks. I feel that I have all to utter not keep vnutri.Nakonets all ends - very sharply offense disappears as dust, which brushed his hand from the table. In its place comes to mind. Comprehensive peace of mind. I sink into the feeling. I'm surprised and at the same time, I feel that it is this power and was hidden for offense. But why am I so touched? Because I myself do not admit of events, including those that came today. All proceeds from the consciousness. I myself have given their confidence in life. When I realized this, resentment disappeared, vanished. Came inner peace. I read the book "To see the face of God" in the same breath. I see myself in Omega, I know that you want to change your daily routine, give or distribute part of their work ... all this have to do if I do not want to aggravate the situation of the health of the body. Resistance powerful, every day some excuses, fears. But I feel like my life begins "obkladyvat" on all sides, it is better to obey and begin the process of change without opposition. Today, the street is very warm, the snow in the morning already darkened. The soul rejoices feel spring is around the corner! I realized in this game that the most important thing to remember constantly: Nothing serious happens all just a game. This is an important understanding, and I have to return some of the tools themselves in at the moment? "Why am I so it hurt"
Cats came and lay down on the table directly in my notes, and the keyboard was like knocking me configure electronic lectures. Well, this is already a specific sign I saw. Ask yourself this question. And what is wrong??? It seems everything is fine. I feel good, I go for the favorite but I feel that something is wrong. Then it dawned on me sharply. TO learn more and work to become independent !!!!!!!!!!!!! AAAAAAaaaaa same rake only from the side. I just took concrete steps to learn how to be weak and dependent, and that's how the fear had distorted my intention to learn. I recalled his feelings when the entered the institute. It was quite different intentions. Turn on the TV, and there is a movie which is coming and one man says to another: Life is a game, and if so you need to bet the maximum. It was about how to get out of a difficult situation in the wild. I immediately caught the sign. And I'm doing what rates ??? But it is not the maximum. It seems to think globally, and the stakes too small. So I loaded that almost caught. Pulled Advertising: Pepsi: "Here and Now"
Again I take seriously what is going !!! Well, I jumped out and asked myself what I want and I knew that I wanted to give love and care for loved ones. I went there and cook with great love and pleasure. Right dissolved process did not even realize how time has flown. Husband disrespectful harshly ultimatum was "demanding" I take the health of his mother. We went to his parents called an ambulance, and came to the conclusion that at the moment all tolerated but will have to intervene because it is an old and blinkered so much that she can not cope. I invited him to live separately from us in a country house or disperse completely. To which he replied, of course not, but in his eyes I saw relief from what I understood him. I realized that actually has in mind. And I realized that I will take all that will be. Trust and merge, that's what I felt at that moment. The merger with the universe. I can not anyone leave or meet, I always have and I will be there myself. With great difficulty, I sit in meditation. The body is like and sat down to relax, but the mind strongly resists. Previously I did not want to relive the pain and suffering, now they are smaller. In everyday life, I think I'm better in the here and now rather than in the hours of meditation. When you sit in meditation, the mind. as goes "crazy" ideas come infinite everything. Sister big problems in the family. I condemn it and resent how many times tried to help her, but nothing but aggression is not received. Stopped again struggling with God, I know better how it should be. I-consciousness sees the unreality Characters bustle of my family. The heart is filled with love and compassion. I am in the moment of manifestation of resentment - employees manipulated me, I (character) in captivity deception. It is unfair to come with me. I feel in the head and compression pressure. Yes I do not mind sometimes "play" with the people, I must admit tricks and deception are not alien to me a character. Mirror. The understanding and acceptance of the manifest resentment, because I and the staff, the injustice of the situation -ponyatiya illusory, and the experience of living a dedicated resentment - in the present moment. A neighbor annoys his stubbornness, lack of understanding of me (ego). Not a pleasure to communicate with him. What a feeling refuse to accept? For all his erudition, his stupidity and incomprehension. The understanding of their stupidity, when I perceive it (the neighbor) seriously. It's a game! This is unreal reality-neighbor, I, my belief that everything must happen in my scenario, t. E. My thoughts emanating from the unreal character. And resentment manifested in the present moment there is a real concept arising from mind games, which gives way to the next moment of grace. It is only the experience shown in the present moment. I went to a birthday to her friend, warned that the diet and can eat only a thread and a little lean. As a result, when he took over the dessert broke down and ate a little plum dessert with nuts and sour cream. Half an hour later began a sharp pain in his stomach. On the one hand I understand that as a sign to follow the diet, and the other is the realization Games, that everything is done through me. Evaporates sense of disappointment on the one who ate the dessert))). Feelings of stress, guilt, fear, and that is bad in the eyes of her mother in law. Again, too, the belief that everyone should enjoy and everyone should love. Turns Vision, which plays the role of mother-in-consciousness, and everything is done through me as the character becomes easily. What a difference that anyone will think ... After all, it's just a thought cloud and player meets their understanding))). At the present moment I understand - I do not want to remember his past. Not because it is painful and difficult. No. What for? Just to talk ... the difficulties and suffering I already do not take, do not even recall anything ... or erased ?! Now, I - not the one I am now past Ya - warrior who does not need a personal history. And today I found out, I realized realized that my previous stories (as in the stories of past lives - how many? ), There is no need !!! And it's time to just get rid of these unwanted memories. It is important now, in the present, to understand themselves, accept everything coming into my life as I experience necessary! How can I get rid of personal history? Stop rely on past experience, for obsolete and unnecessary convictions recorded in the brain as a computer program. And suddenly her husband's words, "That's why I promised myself no longer trust that the women - anyway cheated horns instruct ..." Oath! He promised himself! And at once I remembered my situation, my first marriage. And I gave myself a vow. "I'll never trust men!" ... After practicing, it's warm and calm. I continue to think in the old way? No. This event is my past life is ready to erase from memory, there is no need to remember it, the experience extracted. Persuasion is out of date, and there is no need to keep his word. My promise to myself the more I do not need! You can delete this oath, and this episode personal history. Game. Joke Consciousness. Focus. It was fun. After talking with her husband, I easily explained to him his attitude towards oaths and vows. And he agreed to his promise, too, is out of date. And you can delete it from memory as unnecessary. We all, every character in every moment of life gains experience. He lives it. That's the value. And every experience is needed. Thank you for the experience of Consciousness! And now, as an adult, I punish herself with food, not-doing practices yoga - to feel guilty and do not feel the need to go free svobodu.Chtob fear of punishment, running from fear of punishment, and she is engaged in self-punishment? Idiocy and more! Again, blame .... and so create yourself wheel of samsara!))) A sigh of relief - another puzzle realized! 50% - awareness, the remaining 50% on disidentification! I think its too cocky and stupid, or rather so says the dwarf, who takes with him when not agree, his weakness and helplessness. I identify with a mask, afraid of "bad" emotions - hatred. The rejection of his shadow - a blind spot. It identifies the problem, emotion. I took to the streets and began to walk down the road to the sea. I went and watched, aware of their suffering. I - no desire, no emotions, no body, no mind. Once we identify. Certificate is valid, evidence of the senses. The boundary between the mask and the shadow disappeared. I went back to work. Here and E. came. They began to work together. It is easy, free. Not yet fully recovered, and then tossed relatives work to be executed immediately on the veranda. Here he is in the cold for several hours pounding hammer, hatchet. I realize - I do not worry, I do not mind, I do not feel I am not the emotions. I am not the body and the environment. No fear. I step back from the problem. I - witness the event. I find himself in equanimity of mind. He very calmly reacted to this situation, only a little laugh. Laugh, that's the key point! Immediately I remembered his father and his reaction to his mother. He often joked and laughed at her mother over her stupidity. Pictures before my eyes and I see myself, as I watched my father and his behavior. That's when I gave myself a vow - I will not be such as it is, stupid! She remembered her recent words: "My father was so clever. I was no match for him. "She was trying to be better and not for what it is. It tightness, persistent conflict, resentment and rejection. I track down that I do not accept laziness, inattention, nesobrannost, frivolity, fear of the unknown and poverty! When the job went to explore the idea, dwarf began to whisper you and so she knew everything, why do you write (krutost- imaginary fear of each other), and in fact led away from the consciousness of the present moment, playing Consciousness. Now I understand how important it is to write -vvesti diary, because you are in the present moment. I'm finding - hunting that launches my anxiety when I wake up each morning. The moment of awakening is slipping fast and the idea behind it is a feeling of anxiety and pressure, burning, compression in the center of the chest. Then all of the solution and vacuum appeared empty, I'm feeling disappeared with the body, only emptiness! Do not believe what you see - it means to be an observer, conductor. Watch mirage, see the play of Consciousness. 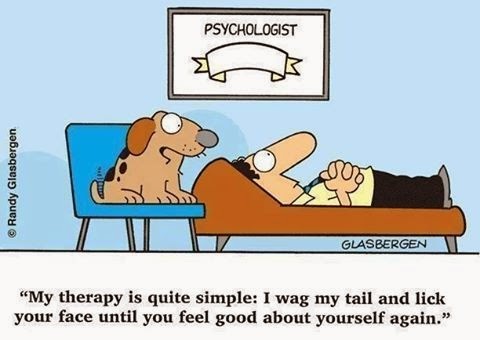 "My method of treatment is quite simple: I wags his tail and licks your face, as long as you're not feel good."